The infamous Nintendo creation is to appear in a episode of cult tv show, South Park. The creators of South Park are always in the news for some reason or another, only a week or so ago they were barraged for showing Steve Irwin in one of their episodes. It seems that Nintendo's latest Wii console has also been featured in the hit cartoon. 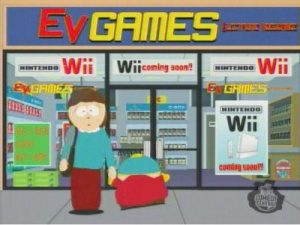 This weeks episode sees Cartman desperately awaiting the launch of Nintendo Wii. Cartman is so desperate to get his hands on Wii he decides to freeze himself so that he can be awoken in 3 weeks time for the launch of the console. However, all goes wrong as he wakes up in the distant future, in year 2546 there is no Wii in sight.